Students are exposed to concrete learning activities in the classroom (physical or virtual, e.g., online) that require them to reflect on what they have experienced in relation to concepts/theories being covered in the course. All classroom focused EE strategies contribute to addressing student learning outcomes. This experiential education strategy allows students to apply theory and course content to concrete experiences that encourage reflection and conceptualization. These experiences not only encourage active learning but also include structured reflection, encouraging the student to refer back to the experience in an effort to make sense of it by considering relevant course material. These concrete experiences could take place within the classroom or outside the classroom through observation, reflection and practical applications. They are combined with purposeful reflective learning exercises such that the experience is considered in relation to the concepts/theories addressed in the class. Wherever they occur, they count as classroom-focused EE because they prioritize student learning outcomes over reciprocal impact within community. How do students engage in EE? Within the classroom through the use of guest speakers, rehearsals and performances, role playing, visual media, case studies, simulations, workshops and laboratory courses, course-based research or outside of the classroom through interviews with professionals in a particular field, participation in community events, observations of lived experiences that correlate with topics under study, and visits/field trips to sites that are of particular relevance to certain disciplines. To what extent are community partners engaged/involved? As guest speakers/participants, transferring knowledge and/or subject matter expertise within the classroom or as bystanders being observed within the community. Is priority given to student learning outcomes or community partner needs? Student learning outcomes for the course are the priority with this type of EE. How long and how frequently do these experiences occur? Experiential Activities take place throughout the length of the course. Experiential activities make up a significant portion of the course. How are students remunerated? Students receive academic credit for Experiential Activities. Experiential Activities are unpaid. These resources were designed to help you implement the aforementioned experiential education strategies. When should you use films? Where do you access films on campus? Films, videos and DVDs can be ordered at the Sound and Moving Image Library. You can reserve material in person, over the phone (416-736-5508), or online at the YorkU Library's website at least two weekdays before. You need to pick up the material from the Sound and Moving Image Library, which is located on the first floor of Scott library. Using a Personal Response System such as Clickers or an online tool such as Poll Every Where during and/or after the film. Note that there may be a cost associated with these tools, and you must ensure the room is capable of supporting either tool. When should you use a guest speaker? A guest speaker is generally a subject matter expert whom you recruit to engage students in a particular aspect of your course and enhance your course material. They can be used under many different circumstances, and can either bring an exciting topic to life or invigorate a topic which some may find dull. In order to find high quality guest speakers, you will likely need to recruit them as early as possible. Recruiting a speaker early also emphasizes the importance of the date to the speaker. In order to accommodate the schedule of a busy person you may need to be flexible with your dates. If you know the speaker personally then credibility is usually not an issue. However it is very important that you establish that the speaker you are bringing in is in fact an expert on the subject matter. One of the easiest ways of finding credible guest speakers is asking your colleagues to refer you to someone in their network. Send the speaker a syllabus and a list of readings students will have done, or ask for a list from them. Ensure that you and the speaker are in agreement about what to speak about and what you want the students to gain from the experience. Encourage them to use personal experiences as well as to communicate the principles of the subject as they understand it. Before the speaker arrives, ensure they are familiar with the campus and know where you are and where they are. It is useful to send them the map of campus, available online. A limited number of free, one-day parking passes are available for community partners visiting campus as part of an experiential education activity. An instructor must request the parking pass for the community partner. Having an in-class evaluation during the following class can provide valuable feedback to you and the speaker, as well as helping students to learn key concepts. If you and the speaker design the evaluation together, it can also be a tool to help you both understand the ideal outcomes of the lecture. Remember to thank your guest speaker. For example, you can ask the EE Coordinator to provide you with an official Thank You letter for the guest speaker. Using a Personal Response System such as Clickers or an online tool such as Poll Every Where during and/or after the presentation. Note that there may be associated costs for these tools, and you must ensure the room is capable of supporting either tool. When should you use a case study? A case study is the use of a practical example to teach or reinforce basic principles. Case studies are common in professional programs, but can be applied to almost any course or subject matter. Although students may not be able to access a practical application of a theory, you can simulate the experience through a case study. These activities also foster decision-making and problem-solving abilities. Using the above three elements, think of a situation from your experience that could help your students to grasp concepts in your course. What is your goal in solving this problem? What key facts are you considering? What are the alternatives available to the decision maker? Which alternative would you recommend? Why would you recommend it? Case studies can be done during one class, or can be executed over several. These can be especially effective if paired with reading assignments that the students complete before they are given the case. There are a number of ways to do this. One of the most effective can be a class discussion where students are made to take sides and defend their decisions. Participation can be graded using simple systems. On the other hand, students could use reflection papers to describe what they learned and how it has influenced their understanding. Course-based research is a pedagogical tool where student use concepts taught in the course to form hypotheses, gather data, analyze data, and come to conclusions that are scientifically valid. Often, the data can be pooled and used to create an overall class project, and in some cases, this can lead to published research. Why should I incorporate research into my course? Course-based research is a means by which students can be introduced to the scientific method and the basics of data manipulation. Depending on the assignments you choose to construct, they will develop critical thinking and problem solving skills, teamwork, and initiative. They may also develop interest in the research topic, and gain insight into future career opportunities. The York University Libraries have many resources to help students conduct their initial literature review, and find the appropriate information to conduct research. Aside from the librarians who are available to assist students, the libraries also run a number of student workshops to help develop research skills. These workshops can be requested and tailored for your course specifically by contacting the libraries and requesting the workshop. All of the relevant information is on the York University Libraries website. If students are collecting or manipulating data for the purposes of education, that is, if the goal of the students is to gain training and experience in research, an ethics review is not necessary. A course director can, for example, give students anonymised data to manipulate, or even assign students to collect data, as long as there is a clear understanding that the students are working only for their own edification. It is only if the students are trying to answer a research question, with the goal of furthering understanding of a subject, that an eithics review becomes necessary. For more information, speak to your experiential education coordinator, your department or school’s research officer or research administrator, or the Office of Research Ethics. Simulations are activities that place students in a fictional role which requires them to apply concepts taught in the course to solve problems or achieve a goal. Through these experiences students are able to develop decision-making and critical thinking skills. How do I develop a simulation? Simulations are most effective when they are based on current events and involve polarizing issues. An example is a political negotiation between multiple countries, or a land-use agreement amongst multiple stakeholders. Based on the size of your course, you can decide how many parties you want the simulation to have and how big each group can be. How is a simulation deployed? In small classes, it might be simple to imagine a group of stakeholders sitting around a table, trying to come to a consensus. However in a larger class you have to be a bit more creative. One effective technique is to split students into groups, and have each group elect a spokesperson to speak on their behalf. Another might be to have each group make a presentation about their case, and then invite open debate in your class. A third option might be to have multiple concurrent simulations running at the same time. How do you evaluate the results of a simulation? One of the most important marks in a simulation is participation. Therefore, students can grade each other, along with your evaluation. Groups may be asked to present, and students could be asked to write reflective essays or research papers. The evaluation of a simulation occurs at the reflection stage, and can take the form of any of the many activities listed in the reflection section. One way of incorporating simulations in your course is through Simulated Persons. You can visit the Simulated Persons Methodology website to learn more about this methodology, see examples, access teaching tools, and sign up for upcoming training workshops. The website is part of a project led by Eva Peisachovich, Assistant Professor in the School of Nursing. What is a Within Community Learning Activity? This type of activity offers discreet opportunities for the students to engage with the community, and does not require any formal agreement between the university and the partner. The experience is primarily for the edification of the student, and generally takes the form of an interview or observational activity. The student does not take on responsibilities with the partner, and therefore there is less time and commitment required of all parties involved. These experiences allow students to relate the course material to practical applications within the community. They are also afforded an opportunity to make professional connections and gain deeper insights into the course material. Interviews: The students interview a professional and/or community member and use the results of that interview to do a presentation or other assignment. Community Events: The students can attend any number of community events which focus on topics of relevance to the course. They can interact with professionals in their field and possibly listen to lectures, and can reflect on this through an assignment or presentation. Tours: The class can attend a tour of an institution that does work associated with the course. Along with deepening their learning experience, this carries the additional benefit of giving the students a shared experience. The key to all these activities is the element of observation. The students are not collecting data, but rather taking notes strictly for their own enrichment and growth. Students have the opportunity to connect course material with experiences that occur through interactions with community partners that can take place in the classroom or in the community. These connections tend to occur in groups/teams focused on a specific project. Reflection remains a key element, which requires students to link the concrete experience with the students’ understanding of theory. All community-focused EE strategies contribute to addressing both student-learning outcomes and identified community needs. “Community partners” can refer to small-scale local entities from the public or private sector to large-scale local, national, trans-national, entities such as corporations, government and non-governmental organizations. Categories of community focused EE include the following. Community Based Learning (CBL)is a form of experiential education that is interactive with the community but takes place within the classroom. Community partners are invited into the classroom to present pre-defined problems, questions or issues to be explored and analyzed. Students are exposed to scenarios, situations, problems and issues described by the community partners, to which students apply their developing knowledge and reflect on how the actual experience informs their learning. The CBL project benefits both student learning and the community partner. How do students engage in EE? Students are exposed to scenarios, situations, problems and issues presented by community partners within the classroom, to which they apply their developing knowledge. To what extent are community partners engaged/involved? The experience requires consultation between the Course Director and the community partner and clarification of expectations in terms of what students can deliver. Community partners may participate in the assessment of the students’ work if it involves, for example, reports or presentations. Is priority given to student learning outcomes or community partner needs? A CBL project is created/structured so that it benefits both student learning and the community partner. How long and how frequently do these experiences occur? CBL projects can vary in length, from a project that takes place over a few weeks to a project that spans the duration of the course. During CBL students have the ability to work remotely from the organization. How are students remunerated? Students receive academic credit for Community Based Learning. Community Based Learning activities are unpaid. 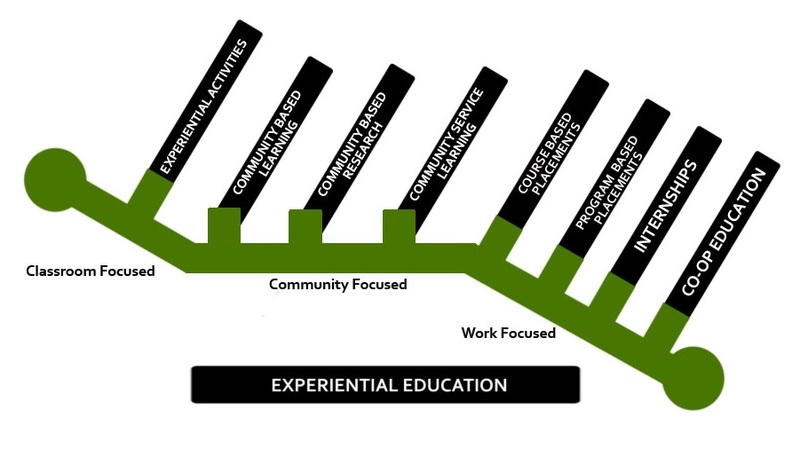 When should you use Community Based Learning? When you want to provide practical experience to your students in a structured manner. When the partner organization has a well-focused issue/question and is interested in exploring multiple viewpoints on how to best handle it. When the organization doesn’t have the resources to host the students. When either your class size is too large to permit community service learning or you are trying to mitigate some of the risks associated with community service learning. CBL is typically suitable for upper year classes. The experience has to be meaningful and related to the class content. The experience can be part of an ongoing project, where students can continue work of a previous cohort of students. Such partnerships can exist over many years. For examples of course outlines which involve Community Based Learning, you can visit the Campus Compact website, available at compact.org/category/syllabi. How do you implement Community Based Learning? We will assume that the community partnership has already been established. Remember that the experiential education coordinator is a resource for you in finding suitable partner(s) and developing a working relationship with them. When planning a course with a community based learning component, there are several factors to consider. Firstly, students will likely be working in groups. Depending on the size of your course, the groups can range from three to five individuals. You will have to structure your assignments with this in mind. Secondly, try to meet your community partner(s) early on (at least one month before the course begins). As you are meeting them, gather their needs and expectations, and ensure that you both clearly understand the purpose of the project. Thirdly, when meeting with your community partner, it is important that they understand that your students are not professionals in their field. You have to manage the expectations that the community partner may have from this partnership, and do your best to ensure that their needs are met, while meeting the learning goals of the students. Since students will be working in groups, they can be assessed by the course director, the community partner, and their peers. Including some level of peer assessment encourages each group member to contribute an equitable share of work to the project. Students are given the opportunity to work on a research project that is part of a course and has been co-created and developed through the collaboration between a community partner and a researcher (e.g., course director). Not only must the CBR activity satisfy the student learning outcomes of the course but it must also satisfy the needs of the community partner. It is: practically relevant to the community; collaborative and action oriented1. The CBR project may take the form of an applied independent research study or thesis. CBR activities are normally completed within the duration of a full-year 6.0 credit course (i.e., 24 weeks), though in some cases these activities are completed in a 3.0 credit course. Community partners often participate in the assessment of the students’ work and benefit from this work which may take the form of project reports, presentations, or recommendations. How do students engage in EE? Students may engage by working on a research project developed through the collaboration of a community partner and a researcher. To what extent are community partners engaged/involved? The experience normally requires a formal agreement between the researcher and the community partner outlining items such as: research ethics, how data will be shared, stored, etc. Is priority given to student learning outcomes or community partner needs? A research project is created/structured so that it benefits both student learning and the partner organization. How long and how frequently do these experiences occur? CBR can vary in length, from a research project that takes place over a few weeks to a research project that spans the duration of the course. How are students remunerated? Students receive academic credit for Community Based Research. These activities are unpaid. For an excellent resource on CBR more broadly, Visit the Centre for Community Based Research website. This is a form of experiential education where "students engage in activities that address community needs together with structured opportunities intentionally designed to promote intentional learning goals" (www.nsee.org). CSL takes students into the community as part of the learning experience. The real-life situation provides the concrete experience for students to apply their developing knowledge and skills and to deepen their understanding by reflecting on their learning. CSL is often used as a strategy to address not only course-based material but also to help students develop an awareness of the value of civic engagement. Note: There are forms of Community Service Learning that are co-curricular in nature. They often include volunteering opportunities for students. In such forms, CSL is not-for-credit. For our purposes, we are addressing only academically embedded CSL. How do students engage in EE? Students may engage by providing direct service (other than research) to the community or by taking on a project defined by a community organization. To what extent are community partners engaged/involved? Community partners often participate in the assessment of the students and may benefit from this work which may take the form of service and/or project reports, presentations, or recommendations. The experience may require a formal partnership by way of an affiliation agreement between York University and the partner organization outlining items such as obligations of York University, obligations of the partner organization, insurance considerations and other specifics pertaining to the activity. Is priority given to student learning outcomes or community partner needs? A service learning project or opportunity is structured so that it benefits both student learning and the partner organization. How long and how frequently do these experiences occur? CSL can vary in length, from a project that takes place over a few weeks to a project that spans the duration of the course. During CSL students work at the community partner’s site and keep regular hours. How are students remunerated? Students receive academic credit for Community Service Learning. Community Service Learning activities are unpaid. CSL is fundamentally about relationship building; relationships between faculty members and community partners, community partners and students, and students and faculty members. As students are exposed to new environments, significant learning occurs. Here are some discreet steps to help you in the planning, implementation and evaluation of an academic CSL opportunity. Before the course begins, it is important to establish a dialogue with the partner organization(s) with whom you intend to work. This can either be done by you or with the help of the experiential education coordinator, who has a wealth of community contacts. At this stage, the coordinator can facilitate the signing of an Affiliation Agreement between the partner organization(s) and York University, often an essential step for allowing students to work within the organization. It is important to meet with your community partner(s) to discuss the details of the student assignments. If interested, the EE office can provide you with a Project Planning Form that will walk you and the organization(s) you are working with through all the important questions to ask before implementing a successful project. Your experiential education coordinator is also available to help. Some partners will require students to do reference checks or certifications prior to working with them. Examples may include standard first aid, vulnerable sector police screening, or other processes. It is important to find out if your partner will require these and if so, the students must be informed as soon as possible. Therefore, you can send out an email to all students currently registered to take your course to inform them of these requirements. Students must fill out all applicable paperwork for their CSL assignment, most importantly a Student Agreement outlining student codes of behavior while off-site. In some cases, an Affiliation Agreement with each learning site may also be required. Consult with your experiential education coordinator to find out what is required for your course. During the first day of their assignment, students should be properly orientated to their learning site. You and your partner(s) can develop this orientation collaboratively (if interested, we have a list of items that should be included in a student orientation for you to consult). Students are encouraged to create a one-page Learning Plan to help them set goals and reflect on their experience (a template is available through he EE office, designed as a simple way to ensure that the course director, community partner, and student all have a clear understanding of the student goals and deliverables as they relate to the project). Keep the lines of communication open with your partner. This will help them deliver relevant feedback, and will positively impact the student experience. If you wish, your experiential education coordinator can help you to coordinate feedback meetings. After the project is completed, aside from grading student assignments, this is the time to sit down with your partner and talk about what went well and what can be improved. Students can be tremendous assets to community organizations. In order to ensure that both the community partner and the students have positive experiences, it is important to prepare the students properly to interact and function in a community setting. Contact the experiential education coordinator for resources to help your students prepare for working in the community. Students have the opportunity to develop competencies and skills and augment the theories/concepts learned in their degree programs by getting hands-on work experience within organizational environments. Reflection remains a key element, which requires students to link the concrete experience with the students’ understanding of theory. All work focused EE strategies contribute to addressing degree level expectations, in particular, the student’s ability to demonstrate autonomy and professional capacity. Categories of work focused EE include the following. Course-based Placements (CBP) This is a form of experiential education where students have the opportunity to develop competencies and skills and augment the theories/concepts learned in their course by getting hands-on experience within organizational environments. The learning emphasizes career exploration and employability/professional skills development (HECQO, Practical Guide for WIL, 2016). (e.g. Communication, Disaster & Emergency Management, History, Portuguese, Public Policy & Administration, Work & Labour Studies and Urban Studies). Students must complete this placement in order to complete/pass the course. They receive course credit but are not (generally) paid. How long do students engage in EE? Students engage in activities where they practice the discipline or course specific competencies and skills in an authentic work context. To what extent are community partners engaged/involved? The experience requires a shared understanding between the Course Director and the partner organization of expectations and student capabilities; as well such placements require a formal agreement between York University and the placement site to address various issues such as confidentiality, insurance coverage, risk management etc. Is priority given to student learning outcomes or community partner needs? The experience is structured so that it benefits both student learning and the partner organization. How long and how frequently do these experiences occur? The placement is usually part-time and requires students to periodically return to class to share their experiences and make meaning of their time with the community partner. The length of the course-based placement typically last the duration of the course. How are the students remunerated? Course-based placements are required as part of the course. Students are evaluated (e.g. report, sponsor evaluation, self evaluation, etc.) on their placement performance as part of their final grade in the placement course. Placements are unpaid experiences. Program-based Placements (PBP): Students are given the opportunity to develop competencies and skills in organizational work environments that augment the theories/concepts learned in academic program settings. Students apply theories and concepts from their program work in a practice-based work environment and reflect upon their actions. Students engage in activities where they practice the discipline or program specific competencies; they receive program credit for doing so but (generally) are not paid. Program-based placements are also known as fieldwork, field placements or practica (e.g. Education, Nursing, Social Economy or Social Work). How do students engage in EE? Students engage in work activities where they practice the discipline or program specific competencies and skills in an authentic work context. To what extent are community partners engaged/involved? The experience requires a shared understanding between the academic program and the community partner/placement site of expectations and student capabilities; as well, such placements require a formal agreement between York University and the placement site to address various issues such as confidentiality, insurance coverage, risk management etc. Is priority given to student learning outcomes or community partner needs? Work is structured so that it benefits both student learning and the partner organization. How long and how frequently do these experiences occur? The program-based placement experience may be full-time or part-time and requires that students periodically return to class to share their experiences and make meaning of their time 'in the field’. The length of program-based placements can vary depending on the degree requirements for the practicum. How are students remunerated? Degree-based placements are required as part of the degree program. Students are evaluated (e.g. report, sponsor evaluation, self-evaluation, etc.) on their program-based placement performance as part of their final grade in the program-based placement. Program-based placements are typically unpaid work experiences. Internships provide students with the opportunity to augment the theories/concepts learned throughout their degree and develop competencies and skills through hands-on work experience related to their field of study. Internships are paid, full-time, supervised work experiences in which learning is assessed via the student reflecting on their internship experience in the workplace and writing a work term report2, which is then reviewed and graded by the faculty supervisor. Internships are generally associated with academic programs that include a practice, service or professionally oriented applications. Unlike co-op students participating in internships students do not alternate work experiences with academic terms. How do students engage in EE? Students engage in work activities where they practice the discipline or course specific competencies and skills in an authentic work context. To what extent are community partners engaged/involved? The work experience requires some form of learning agreement that is shared by the employer, the faculty supervisor and the student. The student's work progress is monitored by York University and work performance is supervised and evaluated by the partner organization. Is priority given to student learning outcomes or community partner needs? Supervised work is structured so that it benefits both student learning and the partner organization. How long and how frequently do these experiences occur? Internship work terms typically take place after a student’s third year of study for 4, 8, 12 or 16 months of consecutive work. Students must return to class for their final year of study. How are students remunerated? Internships are (generally): zero-credit, optional, one-time work assignments. Students receive a transcript notation - typically a faculty supervisor assigns a pass/fail. Internships are paid work experiences. The student completing multiple work terms is normally exposed to the work environment during more than one season of the year. Co-operative education programs can be either for-credit or zero-credit endeavours, and are generally noted on the transcript and degree. Co-operative student positions are most often 4 to 8 months in duration, with a commitment of 12-16 months in total over the course of the degree. Given the alternating nature of work and study terms, co-operative education programs tend, in most cases, to necessitate alignment with a trimester system. To what extent are community partners engaged/involved? The work experience requires some form of learning agreement that is shared by the partner organization, the faculty supervisor and the student. The student's work progress is monitored by York University and work performance is supervised and evaluated by the partner organization. How long and how frequently do these experiences occur? Co-op work terms typically take place after a student’s second year of study for 4-8 months of consecutive work with a commitment of 12-16 months in total over the course of the degree (or 30% of time spent in academic study). Students alternate periods of academic study with periods of work experience. How are students remunerated? Co-operative education programs can be either for-credit or zero-credit endeavours, and are generally noted on the transcript and degree. Co-ops are typically paid work experiences. The Common Language for EE document is also available in PDF format.